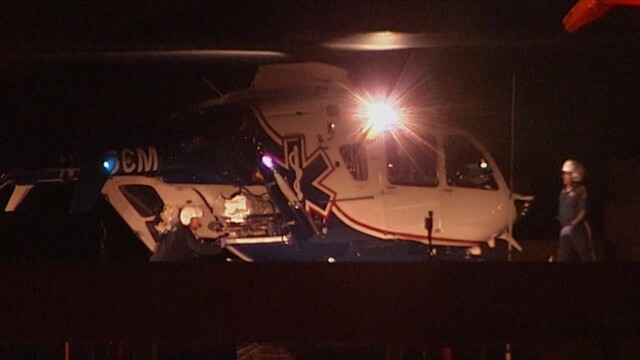 The injured child and adult were airlifted to a hospital in a helicopter like this. Courtesy OnScene.TV. Two people were airlifted Friday night from the scene of a fiery head-on collision in Oceanside. An adult was taken to Scripps Hospital and a 10-year-old girl was sent to Rady Children’s Hospital, according to NBC7. The crash was reported at 8:21 p.m. in the 4600 block of North Avenue, according to the North County Dispatch Joint Powers Authority. Police told NBC7 that two vehicles carrying a combined total of five people were involved in the crash. The driver of the Cadillac drifted over the dividing line and smashed into the F-150, reported NBC7. The victims’ conditions were not immediately available.